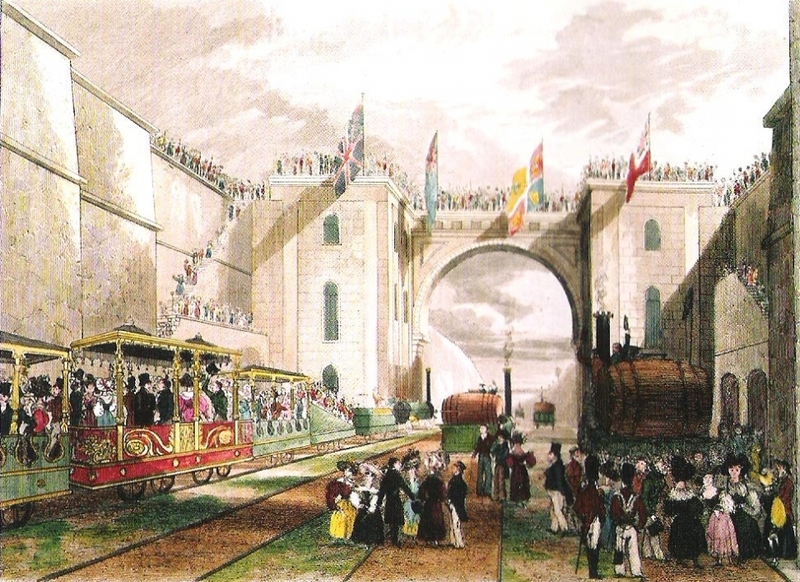 On the opening day of the Liverpool & Manchester Railway in September 1830 there was a special running of eight trains to and from Manchester with the Prime Minister, the Duke of Wellington, in a train pulled by the locomotive Northumbrian. This was the newest engine and ran on the southern track so that it could stop at will and also act as a static base for review of the other trains as they passed. Unfortunately the stop at Parkside to review and water the engines was marked by a severe and ultimately fatal injury to William Huskisson MP when he was knocked down and run over by Rocket. 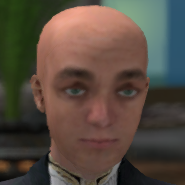 For an event that commanded national attention there is a surprising degree of uncertainty about aspects of the opening day so the posting of a partial passenger list in a blog by a SIM Manchester author is of some interest. The blog suggests that there is no indication of the train to which passengers were assigned (Thomas  provides a longer consolidated list but again without assignment). It is, however, headed "No.1" and with the Prime Minister among those listed it seems plausible that this is a list of those accompanying the Prime Minister in the ducal carriage. Another intriguing feature is the numbering which, I would argue, may reflect a seating plan. Suggestive evidence for this is the otherwise arbitrary placing of Mrs Arbuthnot, Wellington's close friend and confidante, adjacent to the Prime Minister in the list. Moreover, the list as presented is divided into two halves, 1-24 and 25-40. 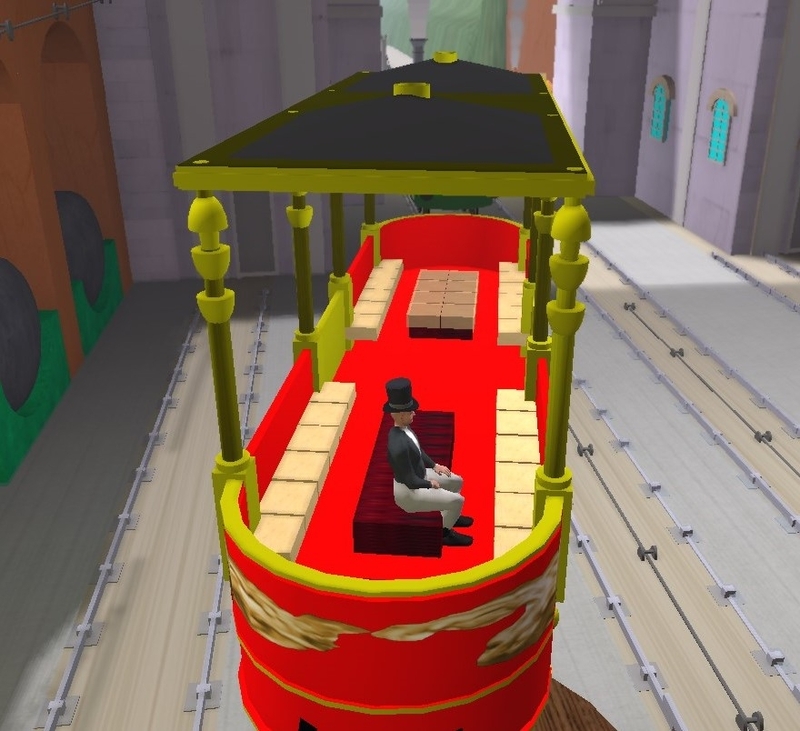 Assuming the structure is replicated in the original document, this may reflect the seating provision in the ducal carriage. Those named in the first part of the list would be seated on four benches, six per bench, running round the sides of the coach and those named in the second seated on two ottomans running the length of the coach, eight per ottoman seated back-to-back. Fig: Print by Isaac Shaw of departure of trains from the Grand Area. 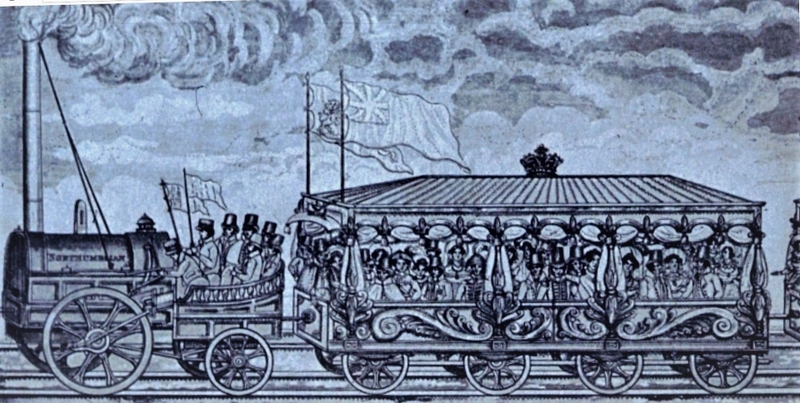 Wellington can be seen acknowledging the crowd by raising his hat at the front of the red carriage on the left. 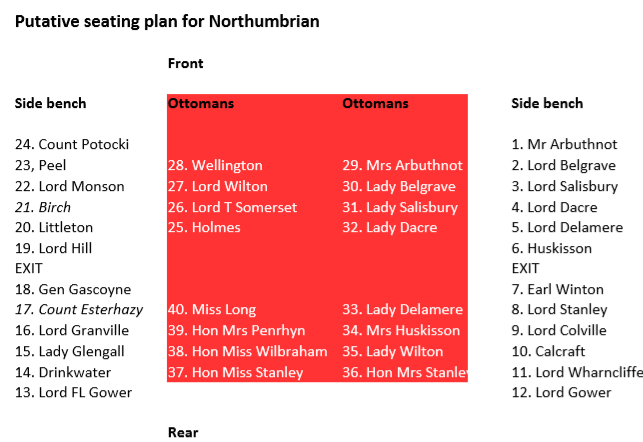 Various sources suggest that Wellington was situated at the front of the ducal carriage, presumably at the end of the ottoman. In Shaw's sketch and print he can probably be identified as the individual at the front of the large 8-wheeler carriage who has a large nose and is raising his hat. There is another useful constraint, namely that Huskisson and Wellington (who might reasonably be felt to harbour a mutual grudge), were unable to communicate directly until Huskisson debarked at Parkside and walked around to the front of the carriage. It may be that Shaw shows Huskisson as the man standing towards the rear of the train. It is notable how few of the 40 passengers Shaw manages to depict from the relatively acute angle and how the preponderence of those is female, almost as if he wanted the viewer to focus on the two males whose faces are readily visible. Fig: Although the artist has truncated the train to focus on major points of interest (and this version is cropped further), the picture shows a significantly larger number of passengers with males mostly at the edges. The presence of a soldier by the (double) door suggests additional staff may have travelled in the ducal carriage as close protection. The ducal carriage was primarily occupied by dignitaries, mostly aristocrats, ambassadors and politicians, with their wives and daughters sitting on the ottoman. In some early pictures the ottoman is in two halves and this arrangement is adopted here. A second print by an unknown, possibly amateur, artist gives a better feel for this arrangement with the duke (in the cloak) shown at the front, men primarily down the sides and women behind them on the central ottomans. Fig: Untruncated version from Museum of Liverpool. The composition of the train accords with most descriptions apart from the additional wagon for the flag bearers. Unlike Shaw's version, it suggests one rather than two smaller carriages for the directors. Given that some directors were in charge of other trains, seating for 20 in one carriage should have sufficed unless, as Shaw appears to suggest, they were accompanied. Fig: Names in italics represent substitutes likely to have been present on the day. Ottomans shown with red background. With the possible exceptions of Wellington and Mrs Arbuthnot, the positions are hypothetical and based solely on consecutive numbering. They do, however, position Mr Arbuthnot close to his wife (for propriety) and the Dacres, Belgraves, Salisburys, Huskissons, Delameres and Stanleys are either adjacent to or relatively close to family members. The concentration of women on the inside (the widowed Lady Glengall is an exception) may have reflected a wish to shield their clothes from smuts and cinders. Assuming she remained seated at Parkside, Mrs Huskisson would not have seen the accident that took place on the other side of the carriage. Those seated by Wellington on the other side are primarily politicians. Lord Wilton's proximity to Wellington may be due to his acting as a guide. Indeed, the proposed addition of Mrs Moss and Mrs Lawrence may have been intended to serve a similar purpose as well as fill gaps. The identity of most of those present is clear with one exception, Miss Long (Thomas calls her Hon. Miss Long). One possibility is that she is a daughter of 1(https://www.historyofparliamentonline.org/volume/1820-1832/member/pole-tylney-long-wellesley-hon-william-1788-1857). At the time she would have been a ward of the duchess of Wellington so it is possible that she accompanied the duke though is seated here with young women of similar status. Fig: Seating layout with a row of six bench seats down each half side and an ottoman in each half accommodating eight passengers sitting back-to-back. A quick build suggests that the seating plan just about works based on 0.5x0.5 m per seat. Of course, those at the ends of the ottoman such as the duke can sit in either front-facing or sideways orientation. He can also make himself readily visible to crowds and passing trains. While passing space in the aisles may be at a premium (as in a theatre), there are useful spaces at either end and the middle for socialising. Further research is required to compare the list with those who actually travelled on the day (some substitutions have already been made). The motivation underpinning any seating plan may be of interest if it reflects the wishes of the directors to promote the railway or reward its supporters. Further understanding of the composition and arrangement of the passengers in this carriage may be assisted by analysis of published diaries. Such were the numbers of dignitaries travelling that day that their absence from the ducal carriage is also a subject of interest. William Long Wellesley, "surely one of the most odious men ever to sit in Parliament"